Who doesn’t love mermaids? And Shark Week is only one of the most popular weeks on television. So, when SEA LIFE Orlando Aquarium asked if I wanted to check out the visiting Weeki Wachee mermaid show and a special behind-the-scenes shark tank tour. How could I say no? Click below for a very special tour of Sea Life on I-Drive at the Orlando Icon and an up close interview with a real live mermaid. Weeki Wachee Springs State Park is open Monday through Sunday from 9am to 5:30pm. The daily admission price above includes access to Buccaneer Bay Waterpark. Daily admission also includes the mermaid show, wildlife show, and river boat ride. Parking is FREE. Annual passes are available for $60 per person and include free admission to Weeki Wachee Springs State Park, Buccaneer Bay Waterpark, Mermaid Shows, Wildlife Animal Shows, and River Boat Cruises. Each pass is good for one year from the date of purchase and includes free admission to all Florida State Parks. For more information about an annual Florida State Park pass, visit Florida State Park Annual Pass Information. SEA LIFE Orlando Aquarium offers a wave of underwater adventures with species from the oceans of the world! Tickets start at $25.50 and combo tickets are available for SEA LIFE and Madame Tussauds Wax Museum and ICON 365. Libraries are full of valuable resources available to everyone, but are often underutilized or overlooked. I decided to visit my local Seminole County Library branch and learn about the services offered. Here are five, to name a few! 1. Enjoy a growing collection of eBooks and audiobooks when you download the Libby App. I'm an audiobook fan myself and have often looked to free trials of Audible.com to get my fix every now and then, but you can access thousands of titles for free on the library's mobile app. 2. Attend a small business workshop and learn how to be your own boss. Not everyone has access to a four-year degree or inherent knowledge about entrepreneurship, taxes, etc.. If you're a small business owner and want to make sure you start off on the right foot or want to improve what you've already been building, check out one the free workshops and network with other entrepreneurs to put yourself in the right direction. 3. Drop in a program and learn about plants, genealogy, and even how to become a citizen. Writers—You can participate in in-group writing exercises, share written work and receive feedback on every third Thursday. Crafters—Attend the Sewing 101 or Intermediate Sewing series to expand your skillset. The possibilities are endless with a full calendar of creative, informational events on seminolelibrary.org. 4. Access Lynda.com online learning and tutorial videos about software, technology, and creative skills. Technology is constantly changing and sometimes your industry requires you to use a certain software that you may not be familiar with. If you haven't heard of Lynda.com yet, you need to get acquainted. You can learn just about anything with a click of a button. Even if you're not accessing Lynda.com from the physical library, you can login using your library card number from the comfort of your home, or anywhere really. 5. 3D print your own unique designs. So, this is the coolest thing. You can design 3D models and watch the printer do its magic onsite. The library provides a list of programs and sites that you can use to find and create your own models and then you simply upload your file to be printed. It takes about two weeks to have the finished product in hand and most designs will cost between $1-5. Try it yourself! Tina Fleming is a partner at Townie Tourist and an Orlando-based travel and lifestyle blogger at Tina In The Sun. She's a cat mom, self-proclaimed foodie, and moonlight singer in an a cappella group called Geekapella. Do you Fringe? You’re either shouting yes, I love it! Or you’re not quite sure what I’m talking about. Or maybe you’ve wanted to go but it seemed overwhelming. The Orlando Fringe Theatre Festival spans two weeks, May 15-28, 2018 and is completely un-juried and uncensored. It takes over Loch Haven Park for all kinds of arts experiences and is truly one of a kind. If you want to learn more about How to Fringe, go here. But this is Tiny Tourist, so I want to talk to you about Kids Fringe. Because unlike general Fringe, Kids Fringe is simple. Walk up to festival, say hello to other people, and have fun. Easy peasy. Kids Fringe occurs on the weekend dates of the festival, May 18-19th & May 26-27th. This year, it will be hosted at the Orlando Garden Club (710 E Rollins St, Orlando, FL 32803) and will have indoor and outdoor space. There’s a main stage with musical and dance acts, puppet shows, sing-a-longs, and demonstrations. Online you’ll find a full listing of each day’s events. My kids love Fringe and running from station to station, stage to stage, to see what’s happening. We can’t wait for this year’s Fringe and will be doing our best rain dance for good weather. We’ll see you there! Kids Fringe is completely FREE. Parking: In the Florida Hospital Garage, the brick lot between Orlando Shakes & Orlando Museum of Art, or street parking on Mills Ave. It can be very hot and sunny out. Wear breathable clothes and sunscreen. Oh it’s not sunny, it’s raining? Pack your rain gear. The lawns in Loch Haven Park tend to have a lot of ants. Have your littles wear sneakers. There are interactive exhibits with arts and crafts including paint. Make sure your kids aren’t wearing their Sunday best. Snacks and drinks are welcome. The main lawn will have food trucks and vendors starting at 11am. Bring a blanket and have a picnic in the park or use the picnic tables in the Orlando Shake courtyard or tables behind the Fire Museum. Kids Fringe is FREE but the Orlando Fringe is a non-profit organization that puts together this amazing festival. If you would like to support their efforts, give here. Orlando Fringe is the longest running Fringe Festival in the United States. It is a unique and wonderful part of the arts scene in Central Florida. Support local arts and artists by going to Fringe and seeing wonderful art of all kinds! 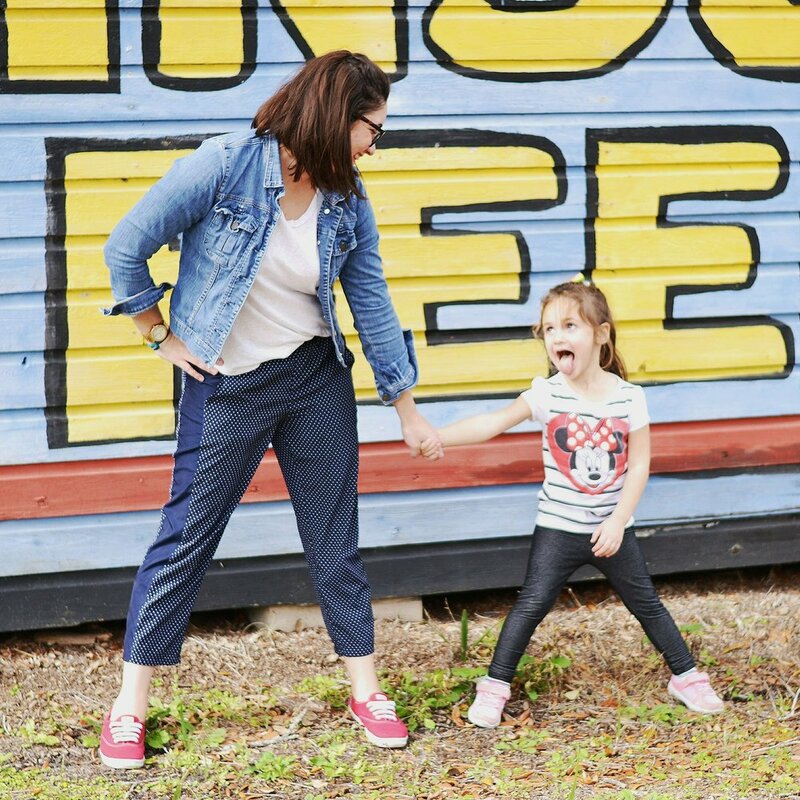 Motherhood is filled with dichotomies that make life so hard and simultaneously so wonderful. I count down to the weekends that aren’t booked with plans. When they finally arrive I try not to freak out while we move from room to room making messes at home trying to fill the day. I’ve realized that with my littles I have to have a plan. We need activities to get us going in the morning so there are fewer meltdowns. Mainly from me. The kids enjoy the little things. And remind us to do so as well. Since having kids life has been a walk in the park. Literally, every weekend we find ourselves walking at the park. It’s the perfect morning activity. We schedule a playground and walking visit between naps and let the kids burn off their energy. Add in meals, maybe a special trip for ice cream, and a visit with friends or family and bam your day is complete. So when the summer heats up, things get difficult. We have to get creative here in Central Florida how we spend our very long hot days. Our morning trips to the park still happen though much earlier and a bit shorter. But wait you say, I’m forgetting one very important factor...the rain? Yes, there’s that too. Dichotomies, they’re everywhere. So we spend long summer days alternating between unrelenting heat and downpouring rain. Creativity reigns in keeping our little ones happy and us parents sane. We have a few go-to’s that always make for a great day. One of our favorite local indoor activities is the Orlando Science Center. New expansions in Kids Town mean there’s even more to do and even our very little guy can enjoy it. For us, there’s no better place to beat the heat. We also take refuge watching children’s theater offerings at Orlando Shakes and the Orlando Rep. All three of these places are located in beautiful Loch Haven Park. If you can stand it, and if it’s not raining, it’s a great place for a walk and a picnic before you head inside. Afterward, we always take advantage of our proximity to Audubon Park and head over to Kelly’s Homemade Ice Cream or Gideon’s Bakehouse (inside East End Market) for a treat. On the days the rain has started long before we wake we make the most of our time inside. I cover the dining room table in kraft paper, bust out paints and stamps and let my daughter unleash her creative genius. I’m amazed that she can sit there for an hour before boredom sets in. Paints are quickly replaced with playdough, then necklace making, and when she’s done with every craft I can think of I tag-in her dad who suggests they make a gigantic fort in the playroom. My daughter monitors the rain all throughout the day. She’s hoping for it to stop only after gigantic puddles have formed in the street. She knows once it stops she can throw on her boots and jump in muddy puddles. To her, it’s the perfect ending to any summer day. Our summer days are long, the messes are huge, but the years will be short. As my kids grow they’ll look less to us for their entertainment and turn to their tech devices (or so I’m told). For now, I soak up all the dichotomies, the sun and the rain, the homemade pictures painted just for me, and the mud-soaked ice cream stained clothes piling up in the laundry after a well spent day. The minute the sweltering summer heat started to let up, I began planning outdoor adventures for our family. The fact is, Bok Tower Gardens has been on my list for years. It always seemed too far and I wasn’t quite sure what was out there. Rest assured, it’s worth the drive. A little history on the Gardens, Edward Bok came to the States from the Netherlands as a child. His family spent their winters in Florida, in Lake Wales. As he grew up he became a mega successful publisher, Pulitzer-Prize winning author, and humanitarian. In 1929 he purchased the land that is now Bok Tower Gardens and made a beautiful sanctuary. The Gardens, oh the gardens with lush tropical beauty and winding paths that felt like they stretched forever. But it was really a quick walk from place to place, super important with the kiddos! There’s also the Singing Tower Carillon, a huge bell tower that plays gorgeous music that echoes through all the gardens. And you can buy a ticket to Pinewood Estate, a historic home on property with scheduled tours running throughout the day. Aside from all this, there’s a special area just for the kids. Hammock Hollow Children’s Garden was a little nature wonderland. Nature wasn’t just the backdrop but the forefront for the kids to explore their curiosity and creativity. There was a sandbox, giant spider web climbing structure, wooden instruments, arts and crafts tables, an outdoor dress-up theater, and a rustic pioneer kitchen play space. I know what you’re thinking, I have all this stuff at home and at the park by my house. And to that I say, yes you do. But do you have it in a gorgeous nature sanctuary that you will swear transports you to Colorado or some other fabulous non-Florida feeling place? No, no you don’t. The kids spent hours exploring and running around. They would’ve spent hours more but the adults were getting hungry. Conveniently, there’s a restaurant on site, the Blue Palmetto Cafe that was quite delicious. We spent four hours at the Gardens and I know we only scratched the surface of what Bok Tower has to offer. With kids or without this is an awesome place for a day trip. Note: Bok Tower Gardens is part of the Reciprocal Member Program with Leu Gardens, Orange County Regional History Center, Polasek Sculpture Gardens, Central Florida Zoo, and Art & History Center Maitland so check and see what discount or free admission this provides you! Be smart, don’t wait to learn this after the fact when you’re writing a blog post. Todd McLellan: Things Come Apart! I wandered through the latest exhibit at the Orange County Regional History Center last week and was amazed by the objects on display from photographer Todd McLellan. He started with one object, a touch tone phone, methodically taking it apart then dropping it from ten feet in the air and photographing it as it fell. Each object's pieces and parts meticulously laid out and a corresponding photograph of the pieces suspended in mid-air. It's fantastic. My favorite: the typewriter. I got to grab a short video the night it opened. Listen in to McLelland's explanation of how he started and why tinkering and taking things apart is now his passion. The traveling exhibit has been made available through the Smithsonian Institute and will be on site until May 6, 2018. One of the unique displays is the Central Florida wall with the Tiki Bird from Disney World and a rare video of Walt Disney explaining animatronics. There's also the Beefy King sandwich, dissected in all its glory for us to behold. My mouth is watering....and I picked the wrong year to be vegetarian. If you're feeling hungry too, FOOD COMES APART will be on Friday, March 23rd and is a culinary adventure of food origin, science, and flavor. Dinner is included! Check out the website for details. See you at the History Center.